Business Phone Systems - Starr Computer Solutions, Inc. Looking for a tech company for your business phone system needs? We can help whether your needs are simple or complex. Starr Computer Solutions can help design a telephone system for your office or business that makes communication with your clients and coworkers seamless. That’s just what you get with us. We are proud to offer Yealink, Grandstream, and 3CX products. We offer these phone solutions because we know they’re the best and most reliable solutions on the market. 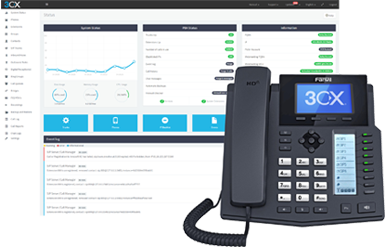 And once we’ve installed some of our business phone products for your business and you’ve seen them in action, we know you’ll agree. Here at Starr, we know our business phone products, and we have the best-qualified technicians to service them. A phone system installation can be complex. Our technicians have years of experience in the field. You’ll save a lot of money long-term when you don’t have to call in maintenance to repair a problem caused by an inexperienced installer. Our Technicians are certified with 3CX and IP phones systems. We also service the hospitality market with Mitel Business systems and Hospitality Systems.